If you don’t know this already, breakfast is my favorite meal of the day and eggs and cheese are my favorite food. I am in love with my Eggstatic Breakfast Sandwich that I continue to make frequently, but the day after my birthday party (hosted by me), I realized I had some mini brioche buns left over, along with arugula and Gruyere. A light bulb went off, as well as my growling stomach–so I went to town. I made my first Fancy Breakfast Sandy! Preheat oven to 250 degrees. Place the bun open faced on a baking sheet and add a slice of cheese to the bottom side of the bun (pun intended). Keep an eye on the “bun in the oven” to make sure it doesn’t over cook. You just want to melt the cheese and lightly toast the bun. Season the egg with salt, pepper, dill and a touch of cayenne, or your favorite seasonings. Cover the pan, turning the burner down to medium or med-low depending on your stove. The egg will be done once you see a white coating over the yolk. If you want to cook it over-medium, cook a little longer. Once the bun is very lightly toasted and the cheese is melted, whisk together a little olive oil & Dijon mustard in a bowl. Spread the mixture over both sides of the bun. 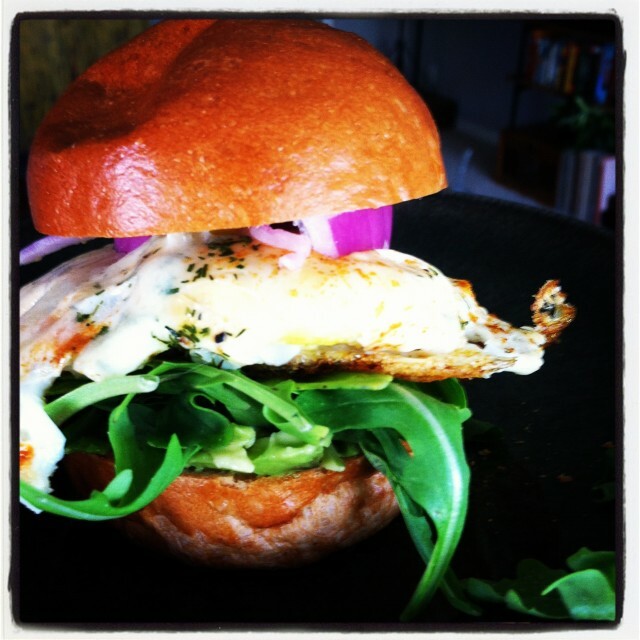 Place arugula, avocado, red onion and egg on the bottom side of the bun. The edge of the egg will most likely poke out of the bun, but it’s okay. It should look fancy pancy and taste like you have a live-in chef. Enjoy! This recipe was also featured on ModernMom.com!